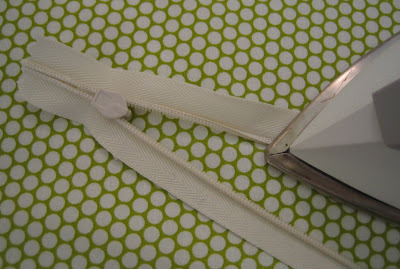 Today I am going to talk about the dreaded zipper. I know there are many of you out there who despise them....really they are not to be feared! Honestly, I avoided learning how to install an invisible zipper for a long time because I thought there was some sort of magic that I didn't know, so I continued to put in conventional zippers until I designed the Sabrina Tunic. I decided then and there (this was just LAST SPRING, people!) that I had to learn how because I didn't want that tacky "take a look at where I put in my zipper" thing going on down the back of my new tunic! It isn't that I hadn't put an invisible zipper in before, but you have to think a little differently to get them in correctly, and I let that cloud my judgment....well, I am SO OVER that now, and I can't imagine putting in a regular zipper on any clothing garment anymore. This was the inspiration for this post as well as a recent email conversation that I had with someone asking if my tunics required the installation of a zipper and that she really didn't get along with zippers too well. I encouraged her to master this technique, as it will open doors for you if you can think...."An invisible zipper? Ah, that is no sweat! "....So without further ado.....Don't Fear the Zipper! You will notice in the following photos that I use a regular zipper foot. I HAVE an invisible zipper foot, but I prefer to use my regular one. Why? I learned the hard way that some zipper teeth get along with the grooves in my invisible zipper foot and some don't. What I found was that the length of the zipper teeth vary from one brand to another, making some brands grip too tightly in the foot grooves. For example, my foot works great with Coats and Clark zippers, but not so great with Unique by YKK. 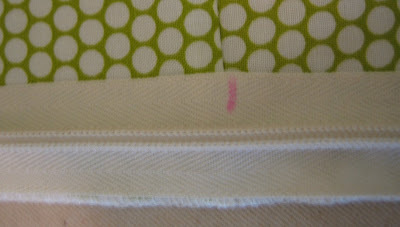 I found that no matter what I did (change the stitch length, pull the fabric/zipper combo through), my fabric would pucker...gasp! No amount of ironing made it smooth. This was enormously frustrating, so I taught myself how to use the regular zipper foot with any type of invisible zipper and I haven't look back since. I encourage you to try this if you have experienced this puckering before....or even if you haven't, since most of you have a regular zipper foot and are under the mistaken impression that you have to have a special foot for these things. Yes, it takes practice to get as close as the other foot automatically puts the needle, but you can do it! It is also important to note that you can substitute an invisible zipper for a regular one in just about any article of clothing. Just remember NOT to sew the seam where the zipper will be placed. 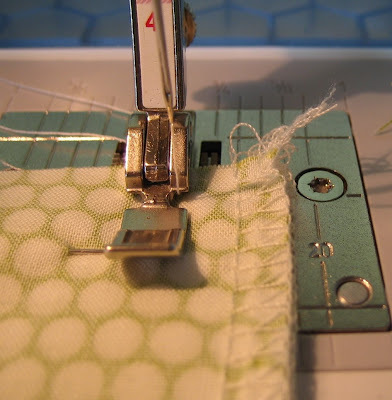 I also find that it is much easier to sew a zipper into something where not much construction has taken place yet, so for the back of a skirt, I would install the zipper before sewing the side seams, for example. 1. Finish the raw edges of the fabric to receive the zipper. 2. Unzip the zipper and place it face down on the ironing board. Open out the zipper teeth away from the zipper and press it flat. 3. Place the zipper along one side of the fabric, right sides together. I like to start with the piece that will be to the right of the zipper. It does not matter which side you start with. Place the zipper stop about 5/8" - 3/4" below the top edge of the fabric. 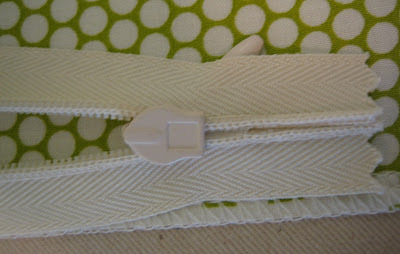 The zipper tape may extend beyond the fabric edge depending on the brand of zipper. (some have more tape extending beyond the stop than others) Have the edge of the zipper tape even with the finished edge of fabric. 4. Move the machine needle to the FAR RIGHT position and have the needle in the "needle down" setting if you have that. 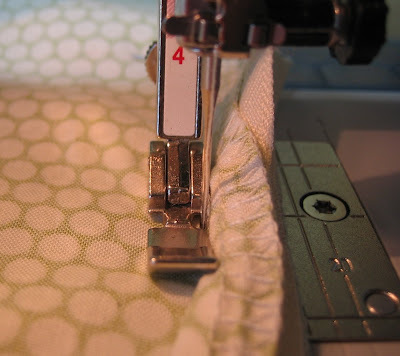 Begin at the top of the zipper, getting as close as possible to the zipper teeth. Backstitch at the beginning and end. Stitch alongside the zipper teeth as far as possible, stopping when stitching becomes difficult next to the bottom of the zipper. 5. 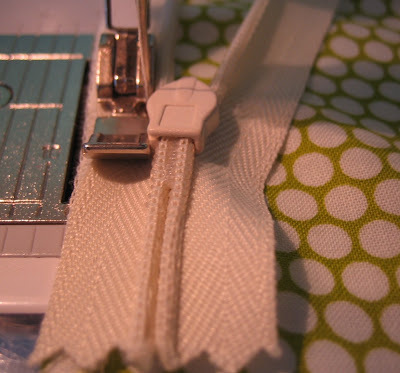 Zip the zipper closed and lay it flat against the wrong side of fabric that you just attached. 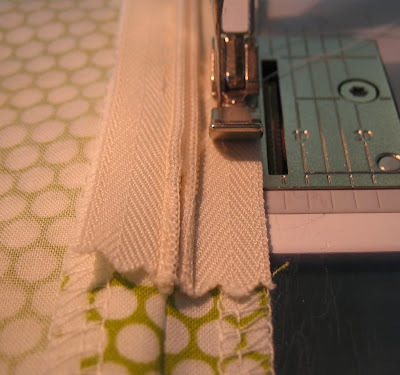 If there are seams that you have passed in the process of stitching the zipper, use a removable marking pencil to place a mark where the seam is located on the unattached portion of the zipper tape. 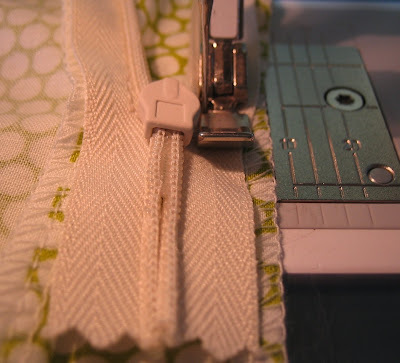 This is very important, as it helps you to line up the zipper to the other piece of fabric and have your seams meet nicely once the stitching is complete. 6. Open the zipper once more and turn all pieces to face right sides up. 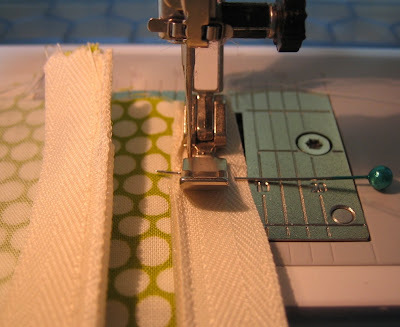 Line up the remaining piece of fabric to the side of the zipper. Turn under what will be the seam allowance and slip the remaining side of the zipper underneath. 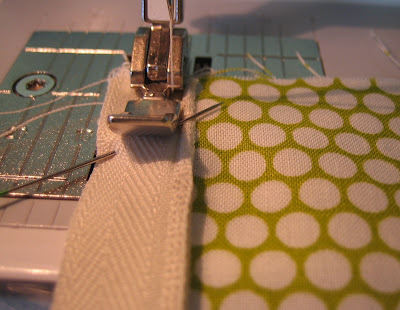 This will put the right side of the zipper against the right side of the fabric. 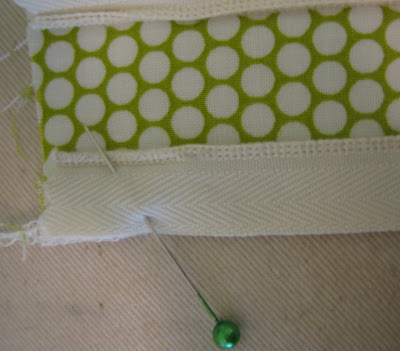 Match up the marking with the seam and pin that spot in place. Check the top of the zipper and pin it in place exactly as the other side was sewn. 7. Stitch the remaining side of the zipper in place in the exact same manner as the first side, only move the needle position to the FAR LEFT. 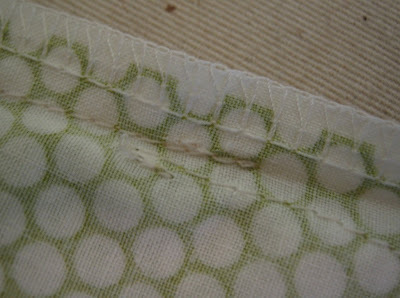 Check your work on the right side of fabric to be sure that the seams and upper edges of fabric meet up appropriately. 8. Zip the zipper closed and match up the edges of the seam below. Pin in a couple of places to hold the fabric together. 9. 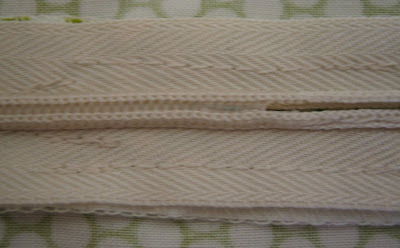 Move the needle position to the FAR RIGHT again and stitch the seam starting at the lower edge. 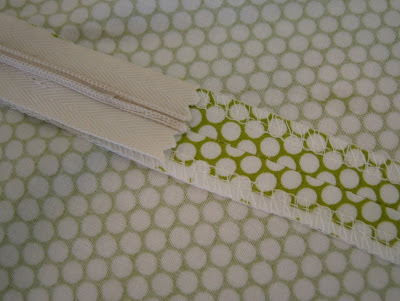 Have the finished edges of the fabric at the 5/8" marking on your throw plate. 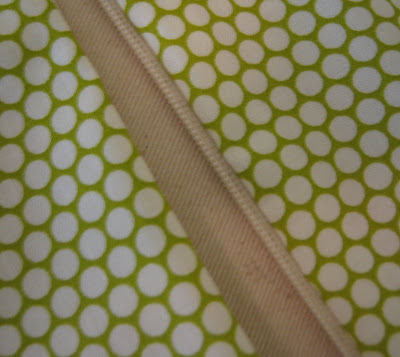 Continue stitching until you have stitched just slightly past the original stitching for the zipper. 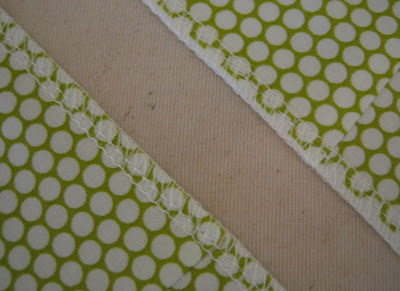 This line of stitching will be slightly to the outside of the original stitching. Backstitch. 10. With the wrong side facing up, press the seam open. 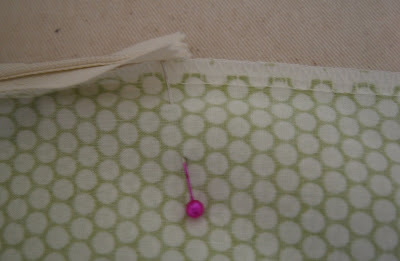 Turn the piece over and gently press the seam, including the fabric to either side of the zipper flat. 11. Back on the wrong side, stitch the zipper tape that extends beyond the stitching along the bottom to the seam allowance on either side.